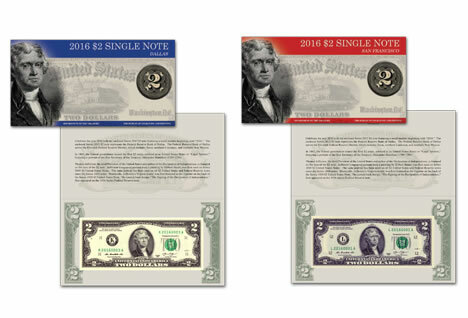 Minutes ago, the Bureau of Engraving and Printing (BEP) started selling its latest and always popular annual product for money collectors, the 2016 $2 Single Note Collection. It features two banknotes with serial numbers beginning with the year "2016." Limited to 5,000 sets with an additional restriction of 25 sets per household, the collection includes $2 notes from two different Federal Reserve Banks. Last year’s collection held three different $2 notes, it was limited to 2,000 sets with 2 allowed per household, and it sold out in a day. a Series 2013 $2 from the Federal Reserve Bank of San Francisco. Each bill is inside a clear, acid-free polymer sleeve that is within a folder representative of the corresponding Federal Reserve Bank. The set has notes with serial numbers starting with "2016," but the remaining numbers will not match — unlike the $1s and $2s in the BEP’s prior money product, the still available 2016 America’s Founding Fathers Set. The 2016 $2 Single Note Collection is $15.90, which breaks down to $7.95 per note to duplicate last year’s pricing. Place orders at www.moneyfactorystore.gov, or by calling 800-456-3408. Should supplies last, the 25-set limit per household will be waived on May 31, and the two notes will be available individually. I agree. But to be fair the cost to print the bills at the BEP is practically nothing compared to what they’re charging. Then again, the mint had Peterson and now Jeppson running the show, two unimaginative seat warmers who know/care nothing about collector coins and coin collecting in general. Great sets always with fancy serial numbers & nice presentation folders & limited editions too. And the BEP always has free first class USPS shipping. The Mint could learn a few good lessons from its sister Treasury Department bureau! Free!!! Built into the purchase price.Regardless nice collectibles. These limited edition fancy serial number FRN set notes are “Hot” items for sure! The $2 FRNs with “fancy” serial numbers in limited edition BEP sets & uncut sheets sell like hotcakes according to my contacts at their mail order sales office in Washington, D.C. (Ms. D. C. & Ms. M. C.) Get them while you can paper money collectors!